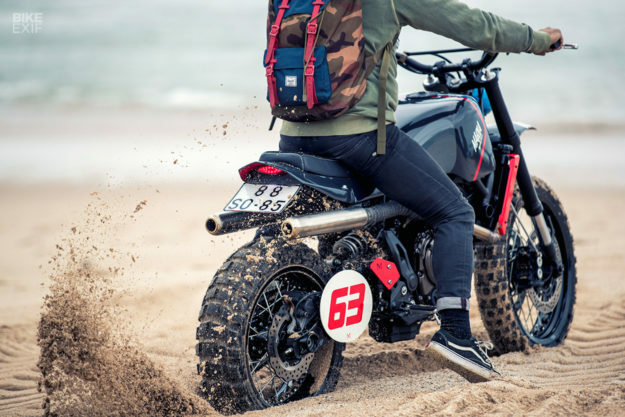 In two weeks, Yamaha will go public with a new adventure bike—a production version of the T7 concept that a small group of European journalists tested back in June. Why’s that relevant? 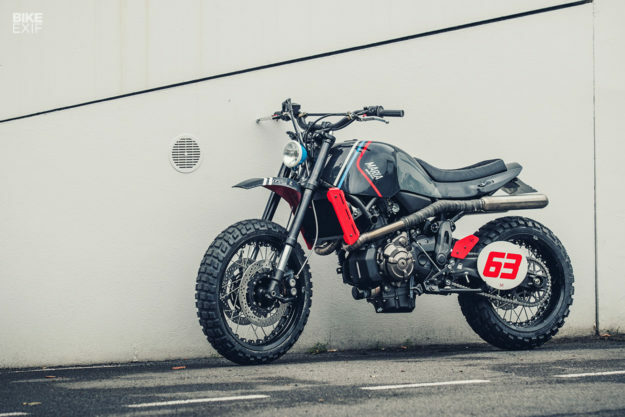 Because it’ll be powered by the same 689cc, parallel-twin motor as the XSR700. We can argue about the looks of the XSR until the cows come home, but everyone agrees that the engine is a gem. It’s punchy and predictable—making it just the ticket for a mid-sized dual-sport. 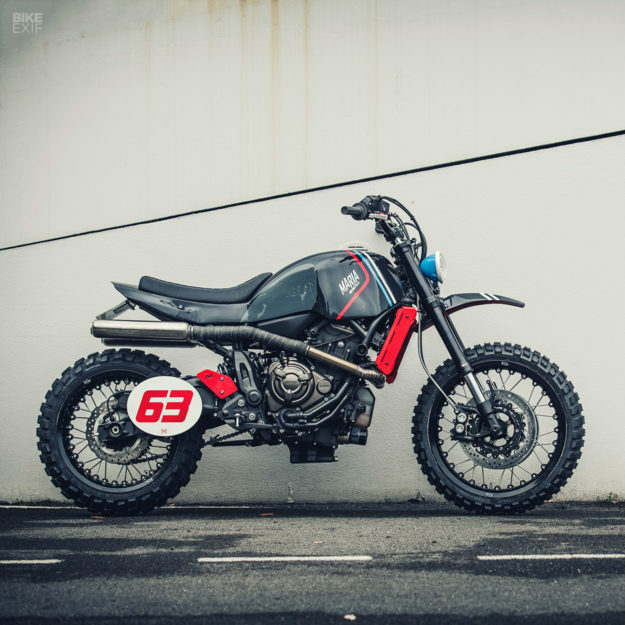 The crew at Maria Motorcycles agree: after taking the XSR700 for a spin they fell in love, then turned it into the jolly mud-flinger you see here. 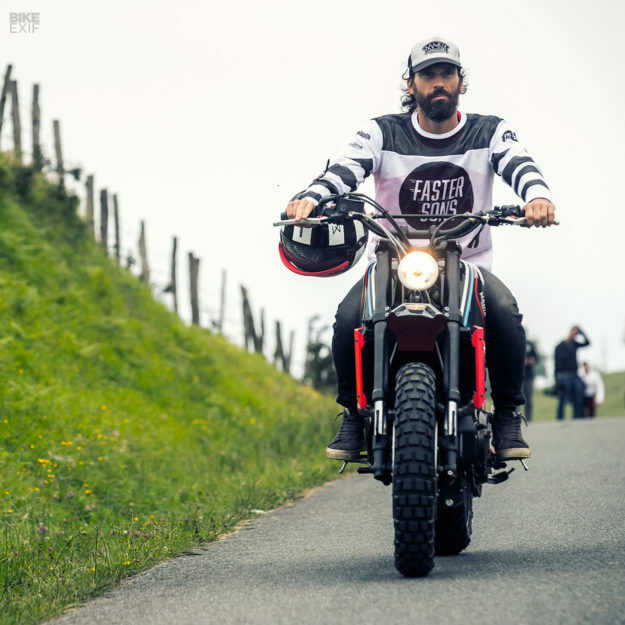 Fast-forward to this year, and an invitation to build a Yard Built XSR700 arrived from Yamaha Portugal. Despite having just four months to complete it—and ten other projects on the board—the Lisboetas accepted the challenge. 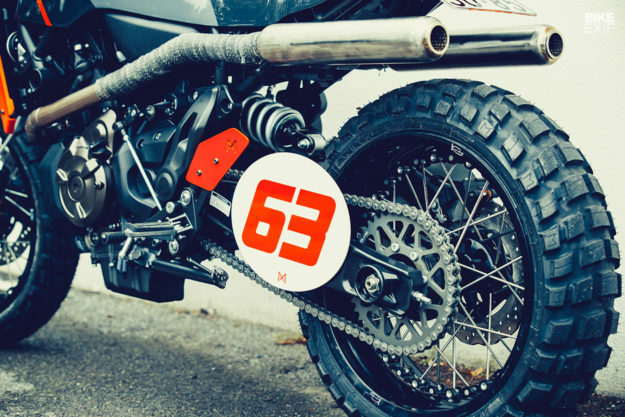 Right off the bat, the guys wanted to steer the XSR far away from its original DNA, by building either a racer or an aggressive off-roader for solo adventures. 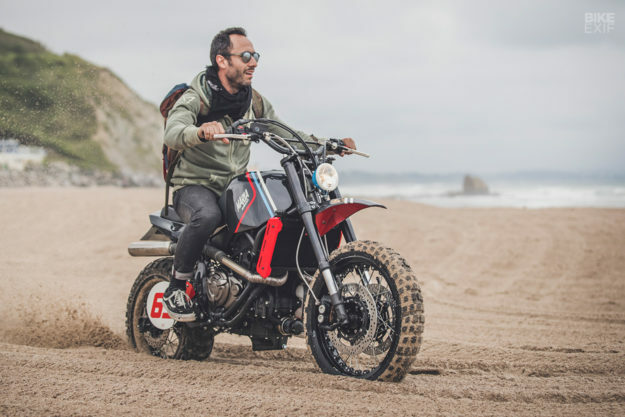 They pitched both ideas to Yamaha, who settled for the scrambler treatment. 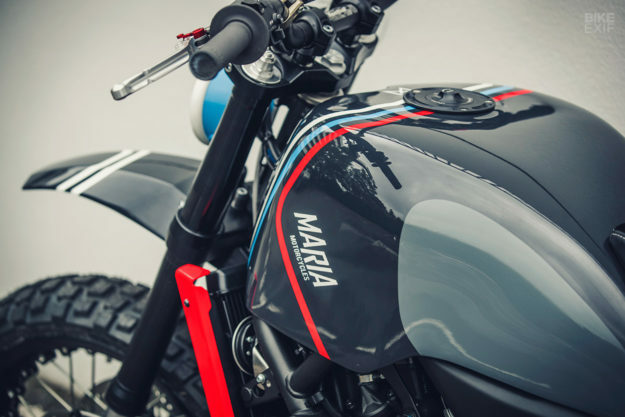 Maria kicked things off by ditching the XSR’s stock bodywork, then designed a new tank and tail piece to replace it. They ended up shaping a monocoque aluminum unit, figuring it would be quicker than building two separate pieces. The stock XSR tank is actually a steel fuel cell under aluminum covers, but this new setup has replaced the entire arrangement—so Maria had to include the original fuel pump too. Mounting it was also a challenge; part of the Yard Built mandate is that all changes are plug and play, with no cutting. 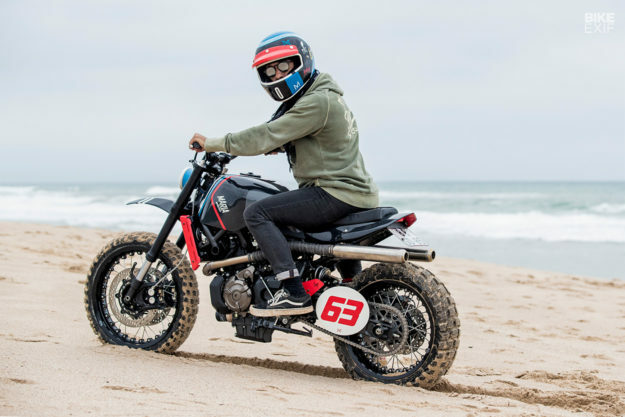 So they unbolted the XSR’s removable rear frame section, and set their new bodywork up to mount to existing tabs (the whole thing attaches via three fasteners). It’s capped off with a combination of leather and Alcantara—chosen for its anti-slip properties—on the seat. The front end’s new too, borrowed from a Yamaha MT-09. 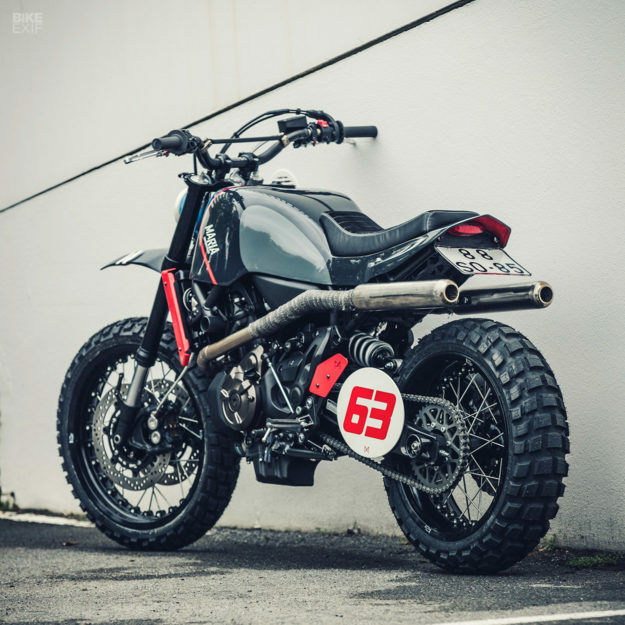 So the XSR gets longer, inverted forks, new triple trees, and radial brakes with more bite. Maria ditched the stock ABS system, since it’s basically useless in the dirt. The cockpit’s equally ‘scrambler,’ with Renthal Twinwall bars, Renthal grips, LSL levers and no speedo. 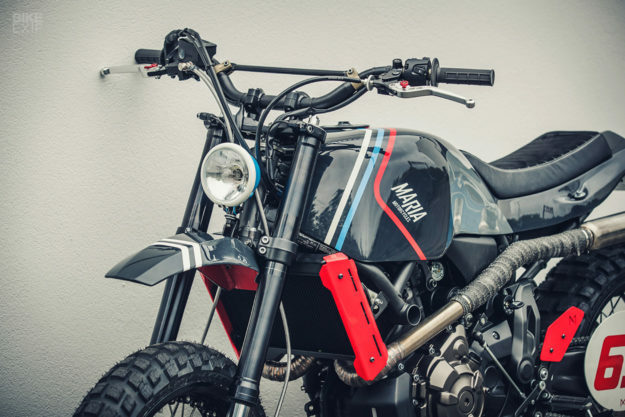 The turn signals are barely visible numbers from Motogadget. For a headlight, Maria fitted the smallest Bates-style light they could, while still maintaining some practicality. The wheels are a pair of swish Kineo spoked tubeless items, with a bump in size up front to 19 inches. And the tires are Michelin’s aggressive Anakee Wild dual-sport rubber. The twin exhausts are one-offs, crafted from stainless steel, and treated to just enough pipe wrap to prevent leg burns. The XSR’s also sporting new radiator guards, blank-off plates where the passenger pegs used to mount, and number boards. We’ve yet to see a Maria livery that hasn’t knocked our socks off, and The Orbiter is no exception. The monochrome base is a nod to spacecraft, while the hits of bright color draw inspiration from the racetrack. We’re sure the new Yamaha #adv bike is going to be a lot more modern and OEM than what Maria has produced here. But will it look better? We won’t have to wait long to see.